It is impossible not to have one if we are striving and trying to reach and stretch ourselves. His was an exceptionally large loss. Billions of pounds which sloshed around away from the banks and disappeared into ether. The rest of us can suffer loss too. We can fail exams, fail at a marriage, be caught with our hand in the cookie-jar, be the subject of a drug bust, have an affair and be found out, be caught in an indecent act in a public toilet, or even more; we can have one or all of the above published in the public domain. The public domain changes the private matter into a public feast. All this can go on. It happens at some level to all of us. What really counts though, is what we do with it. Do we continue as before? Continue making broken promises? Not changing or do we then use that failure to change and launch ourselves. Many keep repeating the same patterns. Not changing anything. 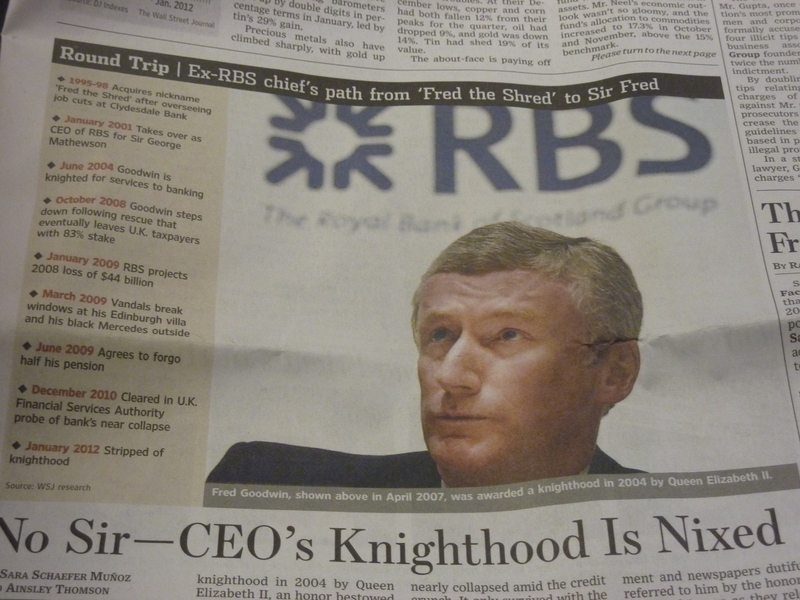 I wonder what Mr Fred Goodwin will do now. I have no doubt he will rise again like a Phoenix. He has a pension of slightly over £6000 a week. His physical body will certainly survive. What would you do if you had that to help you in your next stage of life? What can we do now? What can you or I do to change our own shortcomings? I suggest a spiritual edge to any change. When change is carried out that comes from the heart and not the head or wallet, it is the best change for ourselves and for others.